Photograph of statues in the colonnade of the Chaunsath Yogini temple, Bheraghat taken by Joseph David Beglar in the 1870s. Bheragat is situated in Madhya Pradesh, close to Tripuri which was the ancient Haihaya capital. The Chaunsath Yogini Temple dates from the 10th and 12th centuries and is located on a hill overlooking the Narmada river. The temple is unusually planned, consisting of a circular colonnade with 81 smaller shrines incorporating sculptures from the 10th century. A renowned group represents the sixty-four yoginis, the Matrikas and other goddesses. A note in Bloch's list, referring generally to the statues from this temple, reads: ''These statues represent various çaktis or matrs, and are of interest on account of their bearing ancient labels telling us of the exact meaning of each figure. The plates, however, do not enable me to identify all of them with the description given by Cunningham, whose readings of the inscriptions, moreover, are incorrect in almost every case.'' 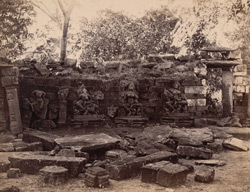 The photograph shows four compartments, in semi-ruinous state, containing statues.